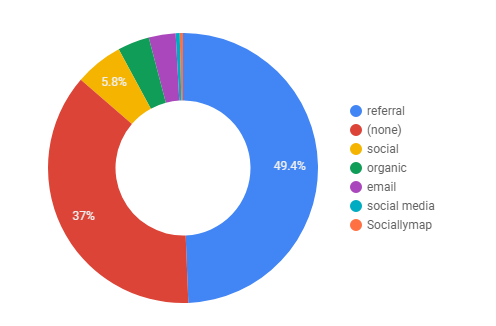 In this post I’ll give a run down of all the different chart types in Google Data Studio. 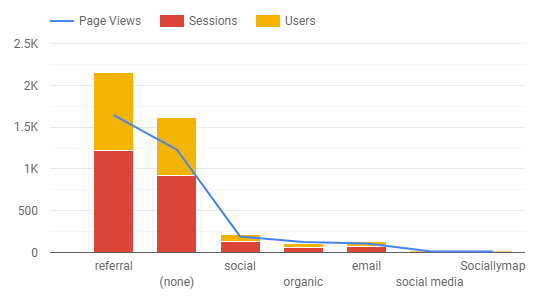 Google Data Studio is constantly changing and improving, and it is adding new features all the time! 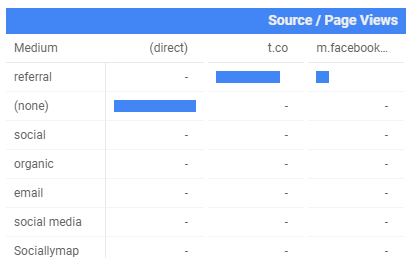 So this can serve as a overview of the different default chart types in April 2019. 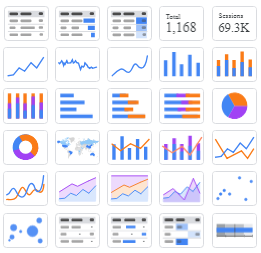 It’s also worth remembering that these charts can be manipulated and changed in numerous ways, and the charts shown below are simply the vanilla, plain charts that Data Studio offers as a starting point. There are three default options for tables. The first type below displays the metric as plain numbers. 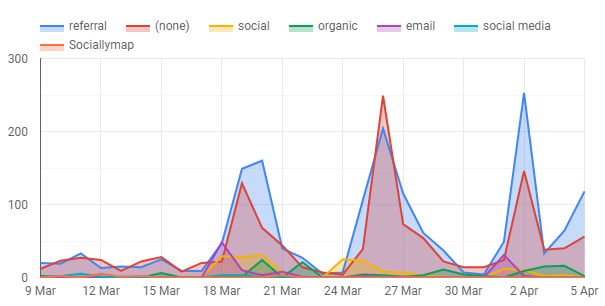 The second displays metrics as bars. The third displays metrics as numbers with colour heatmaps. This is my favourite method of display data in tables. 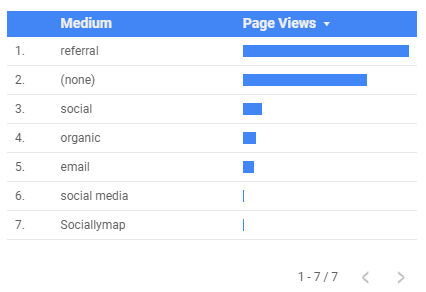 Scorecards are handy for displaying important numbers, for example the total number of visitors to a website during the time period. 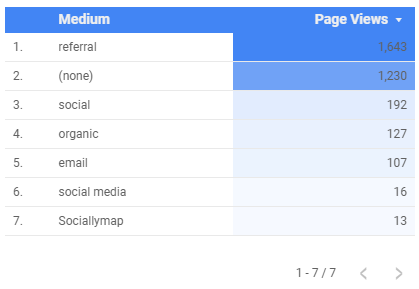 Google Data Studio’s default options are a regular scorecard and a scorecard with compact numbers. There are three different option for time series charts. The first is a time series chart that shows both axes and a grid. The second option is a ‘Spikeline’ chart, without any axes or labels. The third is a smoothed chart that has axes but smoothed spikes. There are six different default bar charts in Data Studio. The first is a regular bar chart is called a Column chat and shows one dimension and one metric. The second is called a Stacked Column chart and shows one metric but multiple dimensions. In the example below it’s source and medium. 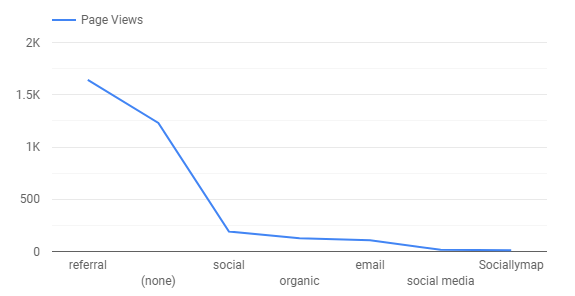 The third option is called a ‘100% stacked column chart’. This is similar to the chart above, but instead of actual metric numbers it displays them as a percent of the total. The fourth type is the plain old bar chart, with the dimensions on the left side of the chart. 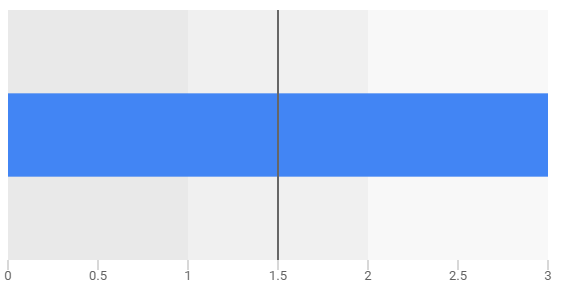 The next is a ‘Stacked bar chart’ showing two dimensions. 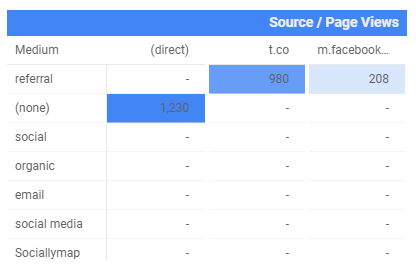 And the final default type of bar chart is the ‘100% stacked bar chart’ which is the same as the previous chart, but the totals are a percentage not actual numbers. There are two default types of delicious pastry charts in Data Studio. The first is a pie chart, which is a whole circle. The second is the doughnut chart which has white space in the centre of its circle. There is only one default geo-map shown on the main menu. 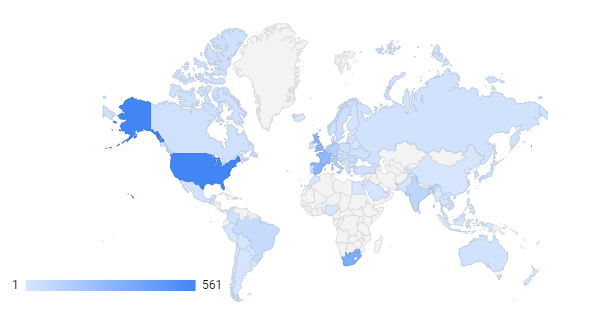 But you can choose many continents, sub-continents, countries and some regions to zoom in on. These line charts are similar to time series charts, but not necessarily based on ‘date data’. 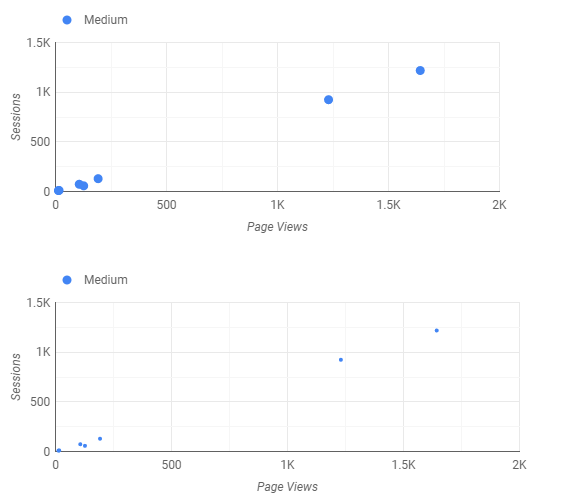 The first type is a combo chart showing two metrics and one dimension. 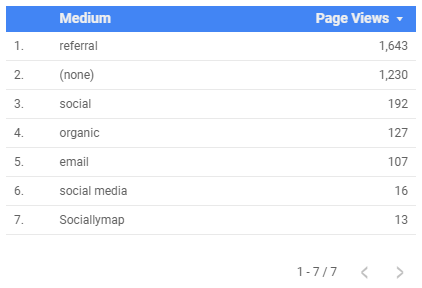 In the case of the example below it’s the medium dimension and page views and sessions as the two metrics. The next chart type is the stacked combo chart. 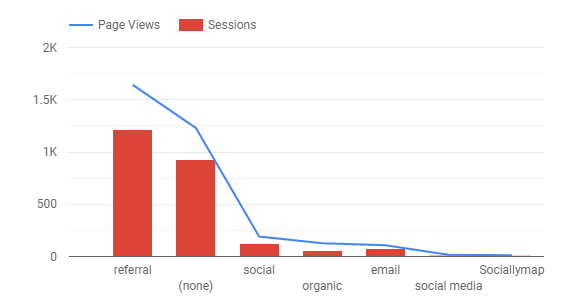 This shows one dimension (medium) and three metrics (page views, sessions and users). Next we have a simple line chart. And then a graceful, elegant ‘smoothed line chart’ that dances like a ballerina on the Data Studio stage. There are three default area charts you can choose from. The first is the stacked area chart, in which metric values are stacked on top of each other. Next up is the 100% stacked area chart. This shows the values as a percentage and not actual numbers. The third option is called the ‘area chart’. This has values overlapping each other. There are two types of scatter charts. The first below is a plain ‘scatter chart’. This maps the dimension onto two axes which are metrics. The second type (second below) adds a third metric to determine bubble size. These pivot tables have the same display options as regular tables. 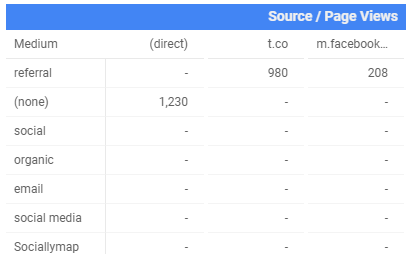 The bonus is that you can cross tab two dimensions in these tables. The first option has the metric numbers displayed as plain text. The second pivot table option displays the numbers as bars. The third type displays them as heatmaps. Bullet charts are often used in dashboards to provide meter or gauge-like widgets that monitor various “health” or performance KPI (key performance indicators). 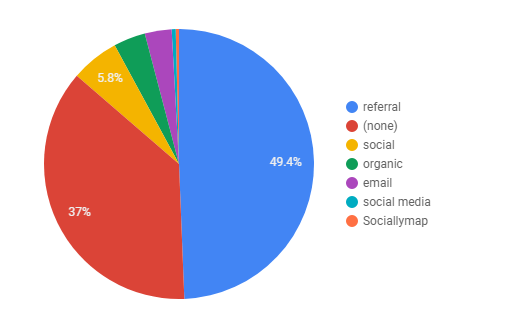 So this was just an overview of the different chart types available. There are so many options for manipulating and changing charts that each one should have it’s one article. So I hope this was useful!